Let me start by saying Oprah herself drove straight past me on Macquarie Street going back to the Inter-Continental hotel and opened the window to wave at fans. This morning was an emotional roller coaster of celeb spotting, generosity, excitement and a good old fashioned cry with one of the real life stories. During the press conference, Oprah said that the difference between Americans and Australians is that Americans live to work and Australians work to live. I have to agree with her on this one and think it’s a valid observation. I have put together some of the highlights from this morning’s taping including details about the generous gift that was given to every single audience member. Actor Russell Crowe, fresh from joining Oprah Winfrey and 302 Ultimate Viewers on the Sydney Harbour, where they joined in a morning regatta sail. 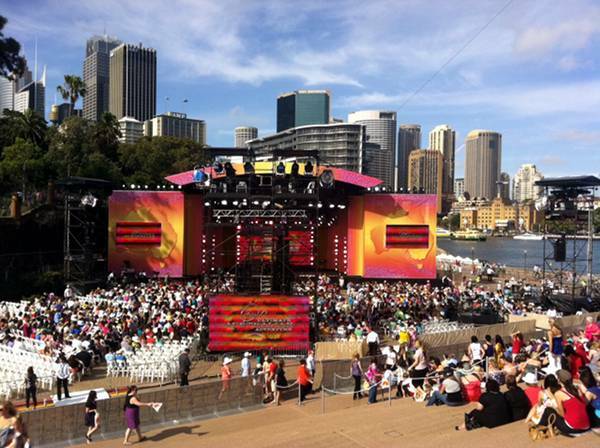 He also mentioned he walked over to the Opera House from his Woolloomooloo house. I have a new crush and it’s on hip-hop superstar Jay-Z who surprised children at Canterbury Boys’ School in Canterbury with new computers for every student and teacher, as well as a new library and music room, worth one million dollars. 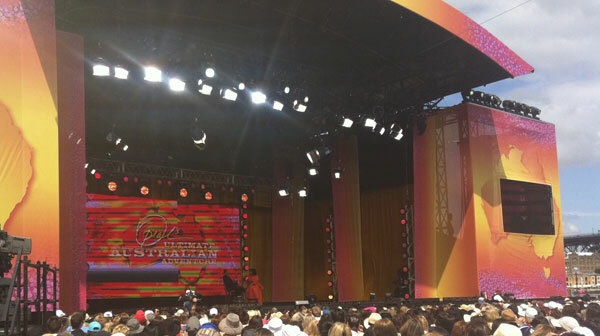 The students were at the taping and Oprah told them there is now no excuse not to do their homework. Bindi Irwin, her mother Terri and younger brother Robert talked about the legacy of their late father Steve. This bought a tear to everyone’s eye as little Robert talked about jumping a croc and how proud his Dad would be. A musical performance of “It’s My Life” and “Living on a Prayer” from Bon Jovi was a highlight for me, they are still brilliant. I saw them in concert when I was 16… a while ago! Australian father Kristian Anderson, his wife Rachel, and their two little boys received a gift of $250,000 so they can take time off to be together as a family while Kristian undergoes treatment for cancer. This made me cry, but it’s not an Oprah episode without a good cry! Finally, everyone in the audience received a specially made Kailis pearl necklace, there will be 6000 made for audience members. Kailis is renowned for its South Sea pearls that Jerry Hall took a liking to during her visit to Perth. 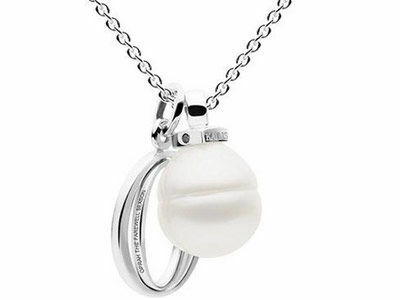 According to the manufacturers, the pearls take two years to grow and another eight weeks to make into the special Oprah pendant with a unique engraving. They are valued at $450 per piece. The “Oprah’s Ultimate Australian Adventure” episodes are set to air in January 2011 on Network Ten in Australia and the taping I’ve just been to is number three in the four part series. 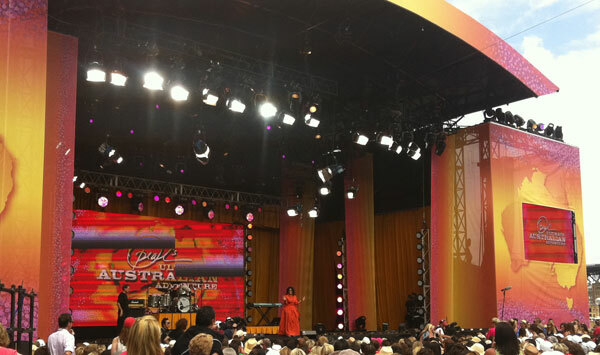 What an amazing experience today has been and I hope you feel I have shared some of the Oprah-mania with you all. If there is anything else you want to know about the events, Oprah, the taping or celebs that appeared this morning, please let me know in the comments below.